You'll love these authentic Swedish dessert recipes. Desserts from Sweden are known to be simple, sweet, satisfying and delicious, and these offer no exception. They're made the old fashioned way using fresh, wholesome, all-natural ingredients that can only guarantee their good taste. 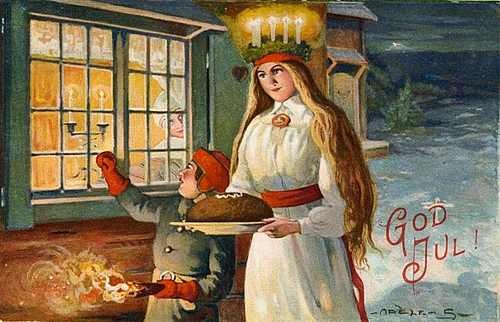 On Saint Lucia Day, December 13th, a young girl is chosen from each home to serve coffee and Lussekatter buns to members of her household. As "Queen of Light" she is beautifully dressed in a white gown with a red sash round her waist and wears a crown made of evergreen branches with lighted candles. Lucia of Syracuse (283-304) was martyred for her faith in 304 AD, secretly brought food to persecuted Christians who lived hidden in the Roman catacombs. St. Lucia Day (also known as St. Lucy Day) is celebrated in her memory. *Note: quantity is approximate because of different types of yeasts available, so some experimentation might be needed. 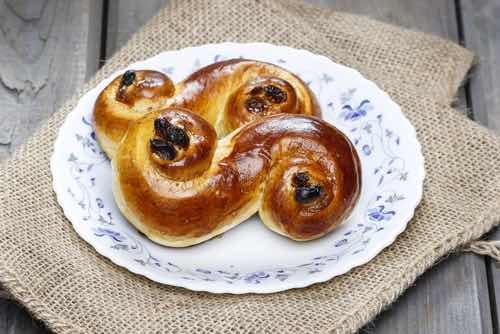 No collection of Swedish dessert recipes would be complete without a recipe for making traditional Lussekatter. Mix milk into butter, sugar, and salt, and stir until dissolved. Cool until lukewarm and add the yeast. Stir well and add egg. Gradually stir in flour and cardamon and beat thoroughly. Place dough in a greased bowl, cover and let rise in a warm place until doubled in size. Knead dough on a floured board for a few minutes. Roll out a small amount at a time and cut into 5-inch strips, about 1/2 inch wide. Form "X" shapes out of two strips on a greased baking sheet. Decorate with raisins. OR, form dough into small balls, roll the balls into 12 inch ropes, curling the ends into spirals to form an "S" shape, then place on greased baking sheet and decorate with raisins in the center of the spirals. Brush buns with beaten egg. Cover and let rise for 1 hour. Bake in preheated 375°F oven for 15 minutes, or until lightly browned. Let cool on wire rack. Makes up to 1 dozen buns. 1 cup butter, 1/2 cup sugar, 1 egg separated, 1 tablespoon cream, 1 teaspoon vanilla, 2 cups all-purpose flour, 1/2 teaspoon baking powder, 1 cup chopped pecans, red current jelly, or red and green cherries. 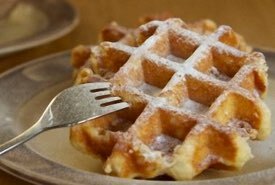 Beat till creamy butter, sugar, beaten egg yolk, cream, vanilla; blend and sift in dry ingredients; mix in 1/2 cup pecans. Form dough in balls, beat egg white lightly with a fork, dip each ball in egg yolk, then roll in rest of nuts. Place cookies on ungreased sheet, making an indentation in each ball, fill dent with jelly, or cherries. Bake at 350°F about 20 minutes or until done. Method: Warm the water and dissolve the yeast into it slowly, letting it rest for about five minutes. Combine the flour, 1/4 cup of sugar, and the salt, then warm a cup of butter and pour it in. To it, add the heavy cream, the eggs, yeast, and currants. Cover and place in the refrigerator to chill for a couple of hours. Remove and divide the dough into six parts onto a floured surface. Roll each part into a rectangle about 10 inches by 6 inches. 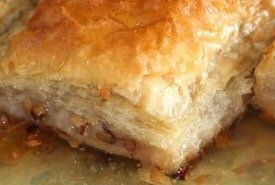 To make the filling, just add the 6 tablespoons of heavy cream to a 1/2 cup of warmed butter, then fold in the brown sugar. Stir in the pecans well. Bake at 350°F (175°C) for about 20 minutes. 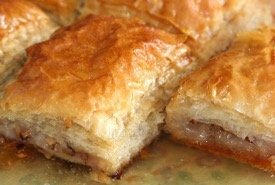 Watch them while baking to see that the surface is a golden brown, but the pinched edges are not too dark. Swedish coffee cake makes a perfect early treat for Easter time or for any special occasion. Keep this Swedish dessert recipe handy year-round. Following an old Swedish tradition, each person must recite a short poem before eating their porridge, and the one who finds the almond will marry in the New Year. Wash and drain the rice and add it to the boiling water. Bring back to a boil and cook rice uncovered for one minute. Drain the rice thoroughly and add butter. Next, combine the rice, salt, sugar, and milk in the top of double boiler. Cover and cook over gently boiling water until the milk is absorbed and the rice is tender, about 2 hours. Pour into a large serving bowl and add the single almond. Sprinkle with cinnamon, sugar, and grated almonds (optional). Serve the porridge with cold milk. This old fashioned Swedish dessert recipe serves eight people. 1/2 cup butter, 1/2 cup sugar, 2 eggs, 5 oz flour, 1/4 teaspoon vanilla, shredded almonds. Ingredients: One-half pound of flour, one-half pound of butter, one-half pound of sugar, eight eggs, a little salt. Rub the sugar and butter to a cream; add the yolks well beaten, the salt, flour, and, lastly, the whites of the eggs beaten to a stiff froth. Put the batter three-fourths of an inch deep into teacups. Cook by steaming them in a steamer about half an hour. The batter will fill the cups. Turn them out on a hot platter. Serve immediately with a clear brandy sauce in the bottom of the dish. Half the above amount will be sufficient for a small family. Sift 1 pint of flour. Add a salt-spoonful of salt, 1 teaspoonful of soda dissolved in a little milk, the yolks of 6 eggs and the whites beaten to a stiff froth and enough milk to make a thin batter. Then bake on a hot greased griddle until done. Serve hot. Mix 3/4 cup of rice in 1 quart of milk; add 1 cup of sugar, a pinch of salt, and 1 teaspoonful of vanilla. Pour into a pudding dish. Put bits of butter over the top and let bake in a moderate oven until done. Serve cold. Mash and strain 3 boxes of currants, add water to make 2 quarts of juice, 1 pound sugar, 1 stick of cinnamon, rind of 1 lemon. Boil it, skim it, and add 1/2 pound sago; when melted and clear, pour into molds. Set on ice, eat with cream. Because puddings are undeniably a comfort food, try this old fashioned Danish tapioca and jelly pudding that's not only colorful, but chock full of goodness and good taste. 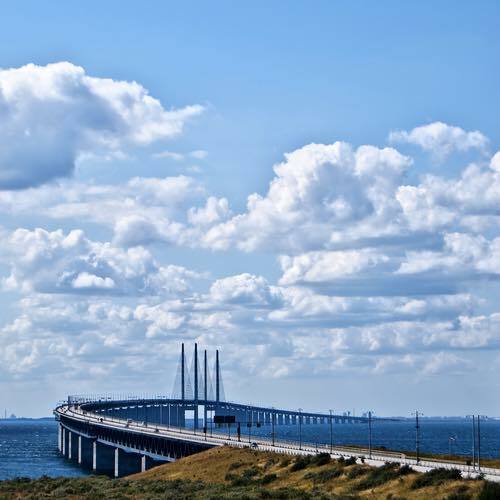 Sweden is linked to Denmark, its south-west neighbor, by a magnificent bridge-tunnel across the Øresund and no doubt this tasty pudding recipe has made the crossing many times. Making this pudding does take longer when the larger bead regular tapioca is used, but it gives it a more traditional flavor and appeal. One cupful of tapioca, three generous pints of water, half a teaspoonful of salt, half a teacupful of sugar, one tumbler of any kind of bright-colored jelly. Wash the tapioca, and soak in the water all night. In the morning put on in the double boiler, and cook one hour. Stir frequently. Add the salt, sugar, and jelly, and mix thoroughly. Turn into a decorative mold that has been dipped in cold water, and set away to harden before serving to table. Serve with cream and sugar. You'll love the wonderful buttery flavor of the Swedish butter cookies and wafers, and the creamy pudding is a joy to serve on any occasion. But, you simply have to try the coffee cake. It's to die for! Believe me. Just close your eyes while eating them, and you'll imagine yourself in an outdoor cafe on Stortorget (Big Square), Gamia Stan, the historical center of Stockholm (pictured above). Make delicious desserts for your friends and family with the help of these traditional Swedish dessert recipes. Treat yourself to something good today!